Little Barn is a Bothy set on the roadside, close to the centre of the town and adjacent to the main listed house. 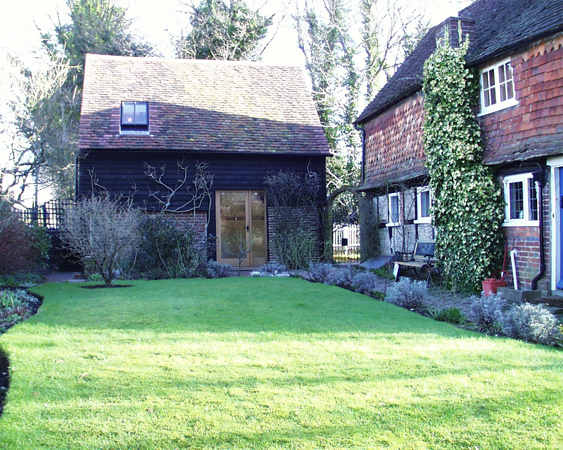 Despite its poor condition at the time of the commission, Little Barn, with a footprint of under 25m2 was itself listed Grade II. The client, who was based overseas for much of the year, wanted to create independent living accommodation for his U.K. based daughter, as the main house was let for most of the time. 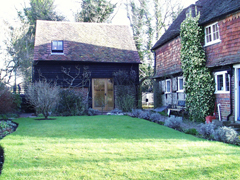 This presented the opportunity to restore a very small but highly visible and attractive timber framed and clad building. The main issue was that any change in appearance from outside the site would be unacceptable in historic building terms, but at the same time creating a quality living environment, however limited, was the brief and that required natural light and some views to the outside. 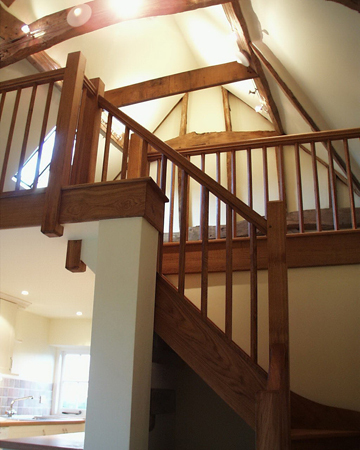 The solution, by use of conservation roof light and windows screened by timber shutters, created a well lit open plan comprising a living space on the ground floor with a small open kitchen in the living space and a shower room. 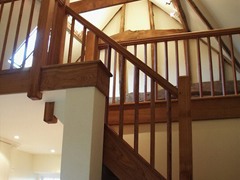 A small mezzanine accessed via a winding oak stair provided the sleeping area within the roof timbers. The secret with any design, especially one so compact, is to use every centimeter of space and to apply great care in the detailing. The result is a charming and highly attractive living unit.